Impression Technology Europe (ITE) now offers a combination of printer and finisher that it claims will satisfy the demands of the established printer looking for extra output as well as businesses looking for a cost-effective entry package. 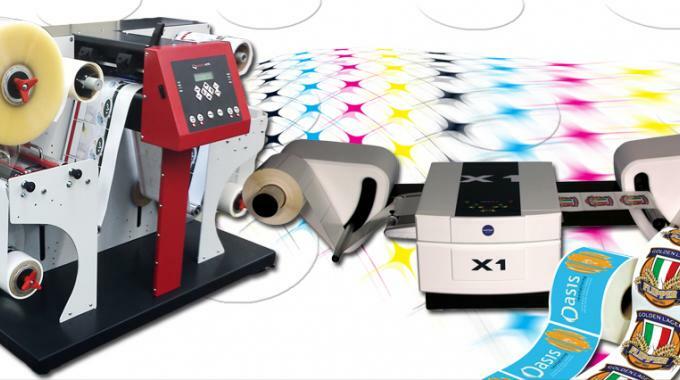 The combination of the Rapid X1 and the Compress Eclipse LF3 gives the user the ability to print and convert standard continuous blank stock into high quality, full color labels fully cut and slit ready for application. Although promoted as a package, each part is also available in its own right. The Compress LF3 is the new part of the package. Launched at Drupa, installations have already taken place in Australia, India, Europe and the US. The LF3 is a compact unit that handles intricate cuts and trims as well as full slitting, giving a finished label ready to apply. The machine also handles lamination. It boasts a maximum label length of 305mm with a cut width of 100mm to 220mm and can handle a roll size up to 300mm (with a maximum core size of 76mm). It uses single point registration for cutting and has full waste matrix removal and rewind. The packaged software, Winplot, utilizes Windows operating systems and has plug-ins for both CorelDraw and Adobe Illustrator. Although it can handle unprinted media, the system is best combined with the Rapid X1 to produce fully finished, high quality printed stock. The Rapid X1 table-top unit utilizes Memjet print head technology to produce high quality printed labels at high speed. The in-line print head does not move, as with other printers, but instead uses 72,400 nozzles to deliver 744,000,000 droplets of ink per second, allowing delivery of labels at a print speed of up to 18m per minute. The machine has an unwind and rewind system and comes with optical sensors for pre-cut labels. Using a 5- color system (CMYK+K), the digital printer runs from a standard Windows PC. Each label can be individual, so whether the user is working on a long or short run, the cost is the same. This opens up the lucrative small order market to label printing that isn’t constrained by higher set-up costs normally associated with small runs, says the company. Click here for more about Impression Technology Europe on L&L.com.